The Eternal Frontier are a Steampunk, acoustical, musical duo, consisting of the good Baron Von Zipple & Professor Adam Smasher. 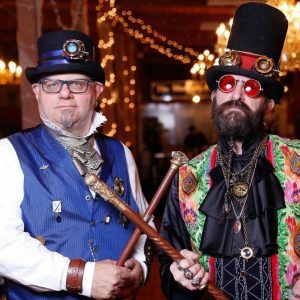 Armed with only their guitars, soaring voices and signature kazoos, these two seasoned chrononaut minstrels, perform Steampunk themed songs original, classic and sometimes bombastic! Professor Mark P. Donnelly (S.S.S./ E.A.A./ B.F.H.S./ S.W.A.S.H.) has been studying armed combat in various incarnations since the age of thirteen. 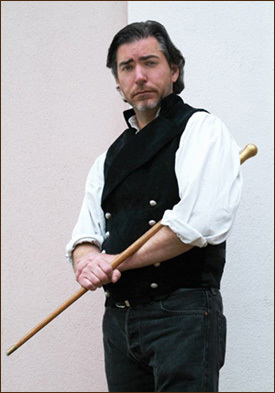 After years of research and training in the disparate disciplines of western martial arts, sport fencing, stage combat, tournament fighting and eastern martial disciplines, he moved from the US to England in 1996 to undertake a PhD in Medieval Archaeology through York and Oxford Universities. Professor Donnelly is joining us for several events this year, more information coming soon! A Halo Called Fred, the clown monarchs of psychedelic steampunk geek-rock, have spent the last two decades making the geekiest sounds ever to spring from guitar, bass, violin, and Tupperware. They have lent their talents to burlesque shows, motion picture soundtracks, rock operas, and their most recent collaborative endeavor is “The Freaky Mutant Weirdo Variety Show“, featuring songs about pirates, cavemen, Steampunks, fairies, and many others, their message is: “We Love You All!“. “Players are artists who create their own reality within the game”. Tiki Tiki Board Games will host the Steampunk (And Other) Game Room – come play games! We have a large library of games to play. Come play Steampunk (and other) board games, card games, and all manner of tabletop pleasures! The game room is available to all attendees be open all weekend long! Stop on in any time during the event and join in whatever happens to be running, or start up a game of something new. Lending library opens when the convention opens and ends each night 30 minutes before it closes.